25mm 9-wall Polycarbonate Standard Rectangles. 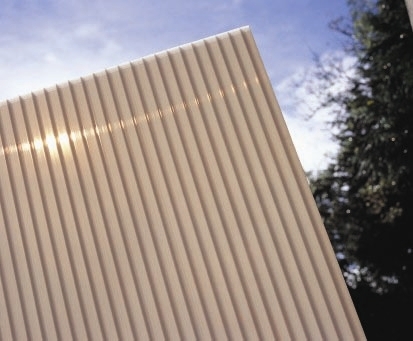 Heatguard-on-Opal (Heatguard external layer, Opal internal layer) minimises solar gain and glare. Bronze-on-Opal (Bronze external layer, Opal internal layer) minimises glare. Excellent insulation qualities, U value 1.4 W/Sqm.K. We recommend purchasing aluminium and breather/anti-dust tape for the open ends of the polycarbonate to reduce condensation and ingress of dirt and dust. If you require Rectangles to be cut to size please select your requirements from the ‘Cut to Size Multiwall Polycarbonate Rectangles’ section. post your plans to our office for a custom cut to size quotation. I would recommend your affordable products (Multiwall Polycarbonate Glazing Sheets - Standard Rectangles | 25mm Multiwall Polycarbonate Glazing Sheets - Standard Rectangles | 25mm Bronze on Opal, Heatguard on Opal Polycarbonate Standard Rectangular Sheet from 4,000mm to 5,000mm long) to anyone else considering this product, as it has been superb. Omega Build Shop | Multiwall Polycarbonate Glazing Sheets - Standard Rectangles | 25mm Multiwall Polycarbonate Glazing Sheets - Standard Rectangles | 25mm Bronze on Opal, Heatguard on Opal Polycarbonate Standard Rectangular Sheet from 4,000mm to 5,000mm long. You are viewing Multiwall Polycarbonate Glazing Sheets - Standard Rectangles | 25mm Multiwall Polycarbonate Glazing Sheets - Standard Rectangles | 25mm Bronze on Opal, Heatguard on Opal Polycarbonate Standard Rectangular Sheet from 4,000mm to 5,000mm long, buy online today!